PUBLIC is located on an unassuming quiet block of Elizabeth Street in Nolita behind a mosiac of different kinds of red brick. The entrance full of plants at PUBLIC. AvroKO is the team behind the design, concept, and branding of PUBLIC, which was their first self-propelled project. In fact, the restaurant group to which PUBLIC belongs is called AvroKO Hospitality Group (all related, of course). The space and décor is inspired by the civic institutions of the 1930s and 1940s, "upon which could be depended for the greater good," as it highlights "the beauty of elements culled from post offices, libraries, and civic buildings." As such, PUBLIC "embodies AvroKO's desire to make quality food a common commodity, thus all things municipal inform the architecture, materials, and graphics. What's more is that AvroKO was awarded two James Beard awards -- "Best Restaurant Design" and "Best Restaurant Graphics" -- for PUBLIC in 2004. So for those design-savvy and design-cognizant individuals out there, PUBLIC is intoxicating with very well-executed décor and ambiance. You might initially think that you would be overloaded by the "civic" theme and the resulting details (every nook and cranny of the restaurant embraces such), but it uncannily works quite harmoniously as a whole. Upon entering, I came across these gorgeous, bronze vintage post office mailboxes. As it turns out, PUBLIC has a quirky little "Wine Mailbox" program which brings its limited members a bottle of wine every month in his/her very own PUBLIC bronze mailbox. How fun is that idea?! Sign me up, please! No. 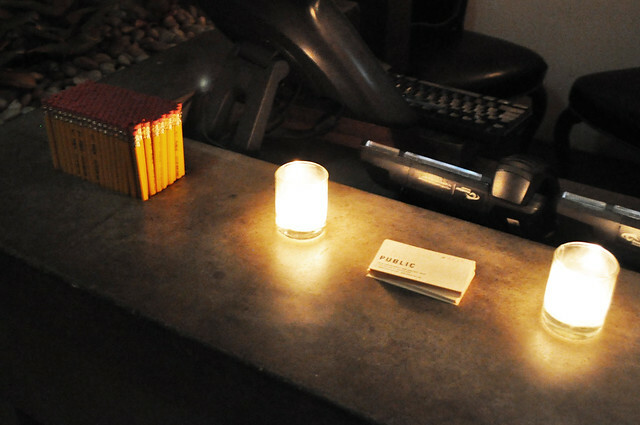 2 seemingly "Dixon-Ticonderoga" pencils inhabit the host/hostess area -- definitely in light with the "civic-ness" going on around here! 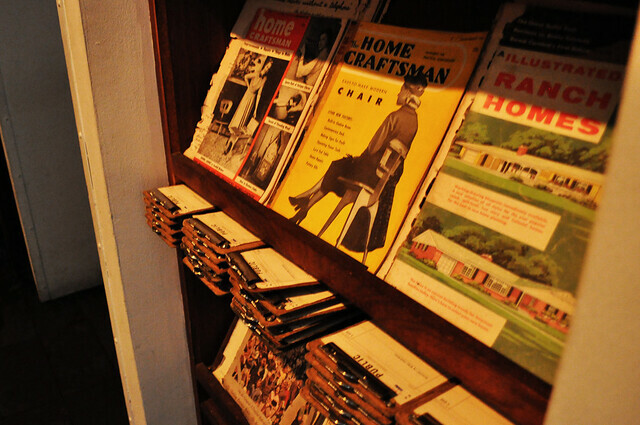 Old craft/home/worksmanship magazines line the entrance to the coat room, along with little clipboards (more on this later). 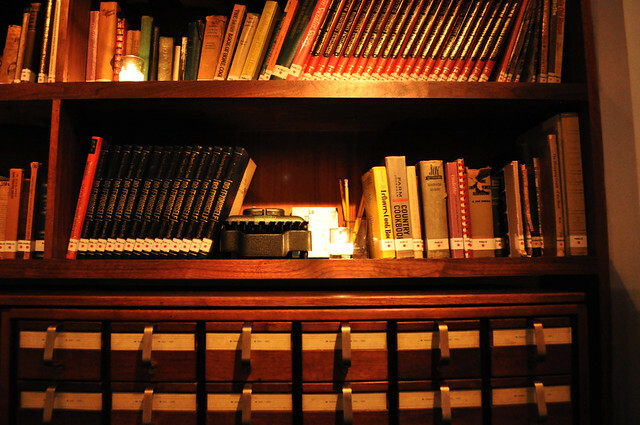 On the other side of the coat room are book shelves lined with library-styled books of many non-fiction genres. 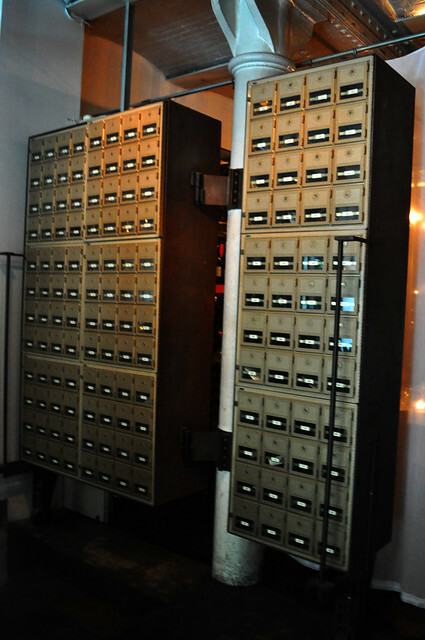 Beneath are card catalogs (be still my heart!) that line the bottom portion of the wall. 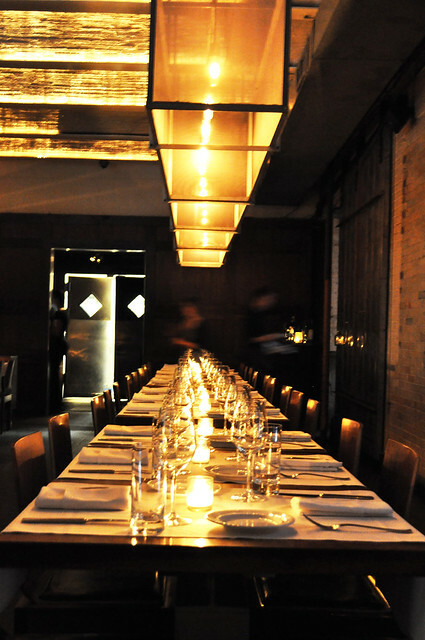 I snuck a little shot of one of the dining rooms -- love the soft ambient lighting done in here. A peek from the rear of the restaurant, looking into one of the private dining areas of the restaurant. The other dining area that opens out into the street somewhat and has an overall airy feel to it. 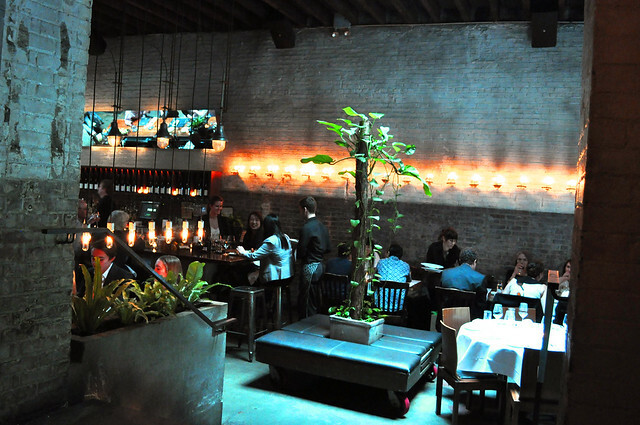 View of the vibrant bar area that appears to be housed inside a loft/warehouse looking space. 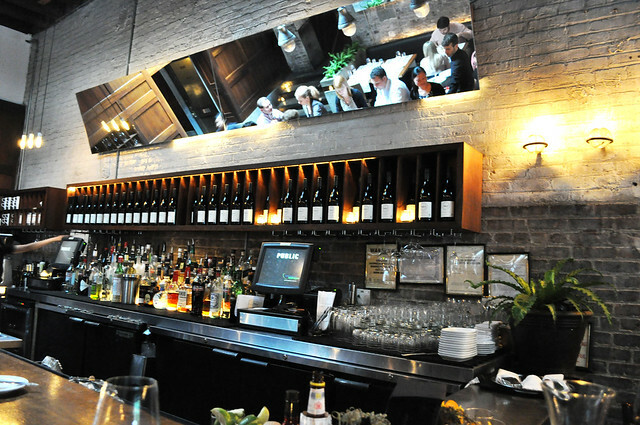 I love the exposed greyscale brick and the angled mirror above the fitted wine bottle shelves. 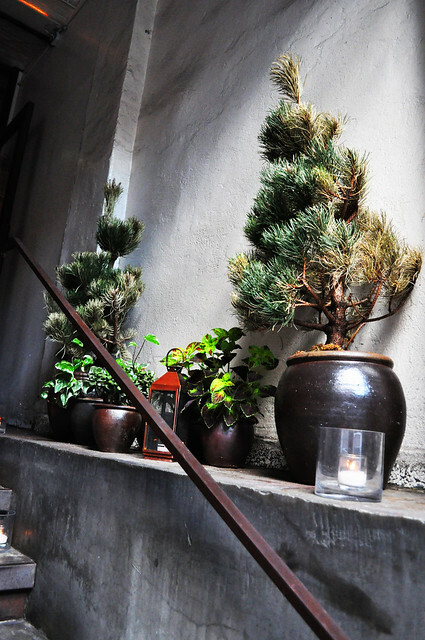 Orbed oil lamps are affixed along the brick wall, creating a soft glow over the dining area. I arrived a little early, so I got cocktail to start -- Pimm’s Lychee Tea with Pimm's No. 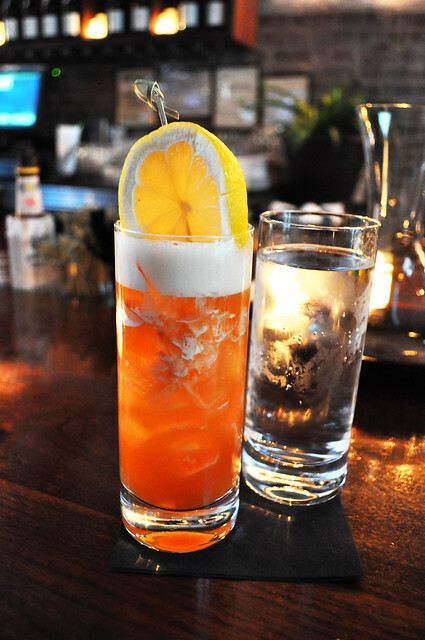 1 (a liquer made with dry gin, liqueur, fruit juices and spices), lychees, Rooibos iced tea (a red tea), and lemon. A very tropical/summery cocktail with a kick of tartness to back it up. Definitely a cocktail to savor for a good while. Once we were seated, we were each given the miniature clipboard menus which emulate a ledger of some sort (whether it's an order form or public record-related). It certainly fit right into the theme once again, making the visual experience that more complex. 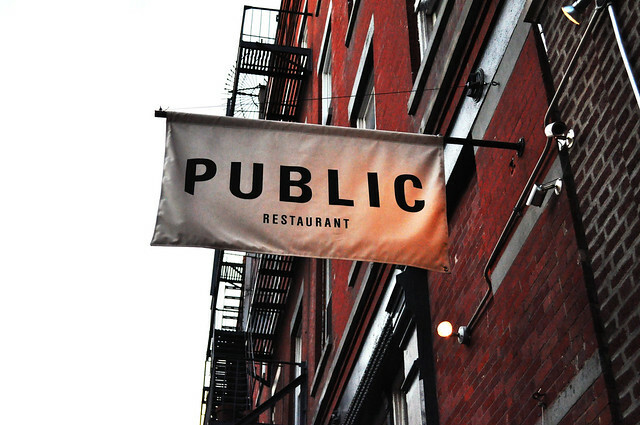 A Pittsburgh native, Chef Brad Farmerie heads the kitchen at PUBLIC. Developing a love for food at an early age, he explored the cuisines and wines of Europe, North Africa, the Middle East and Southeast Asia during a brief college hiatus, which later brought him to study at Le Cordon Bleu in the UK and to graduate in 1996. Upon graduation, he worked in many acclaimed restaurants in Europe, including Coast, Chez Nico, and Le Manoir aux Quat' Saisons. Most influential to his own style of cuisine was his experience working with Chef Peter Gordon at the Sugar Club, The Providores, and Tapa Room. Seven years later, Chef Farmerie returned back to the States "to help conceive PUBLIC, AvroKO's first self-propelled restaurant," where he could explore his creative, global approach even further, a cuisine which he refers to as "free-spirted fusion." 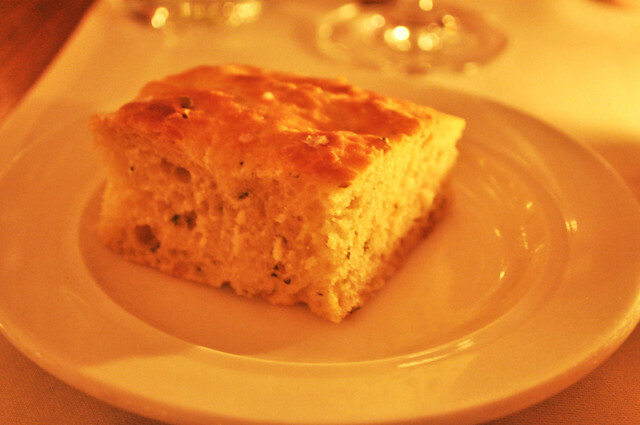 We were given some rosemary lemon focaccia bread -- so soft and flavorful. 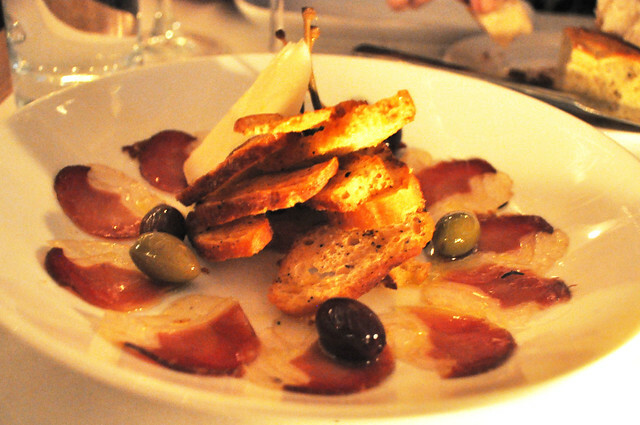 To start, we shared the cured wild boar with Garrotxa cheese, olives, caper berries and crostini. Cut a little thicker than prosciutto di Parma (almost as thick as bacon), the cured wild boar went perfectly with the toasted slices of crostini -- salty, crunchy, and savory. It was a great dish to start off with, just catching up. The olives were lovely too, and the cheese was on the stronger end of the spectrum. 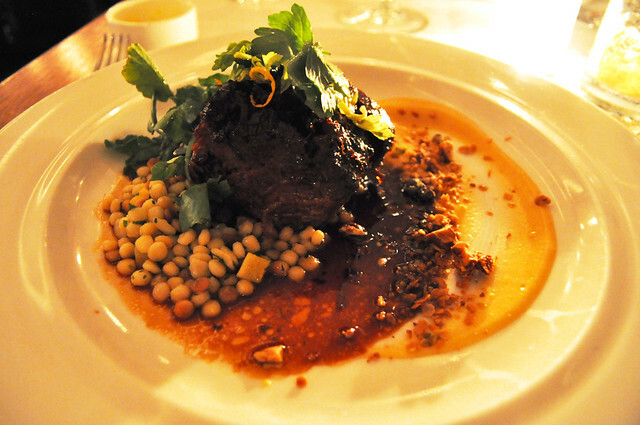 As my main course, I had the braised lamb shoulder with maple rutabaga purée, fregola sarda, and smoked almond granola. I don't think I've had lamb shoulder prior to this, but it was so delicious. As with most well-braised meats, it fell apart so easily and loosely with lots of soaked up flavors. It had the same texture as braised short ribs, only with that familiarly subtle gamy lamb taste (which I happen to love). The fregola sarda (i.e., Sardinian pearls of pasta) was great -- just like the kidn of pearly couscous I would normally have with lamb. I gobbled up every bite of this dish, wishing for a few bites more. I was very impressed with its simplicity and its lovely flavor profile. 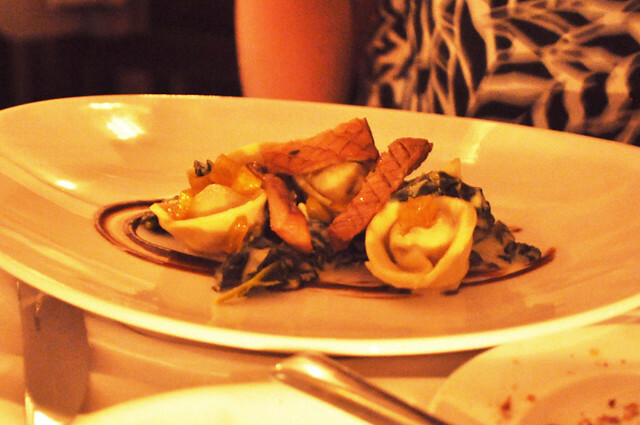 Ariana had the mushroom and ricotta tortellini with Tuscan kale, creamy fennel and a black garlic purée. As we're both mushroom lovers, this was quite the hearty pasta dish with mushrooms as its main ingredient focus. The accompanying details (kale, fennel and black garlic) enhanced the earthiness of this dish further, creating a pleasant blends of tastes on the palate. Considering it was a vegetarian tortellini, it was still very filling and hearty. 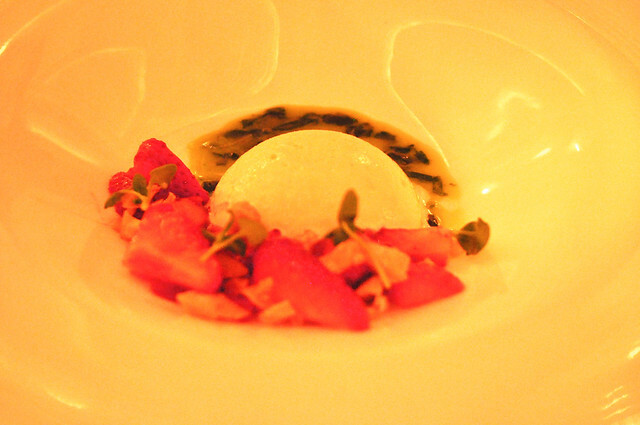 For dessert, Ariana and I shared the white chocolate lavender ice cream with fresh strawberries and marcona almond brittle. It was the ice cream flavor that drew us in, and we were so thankful we decided to order it. The ice cream was really light and subtly fragrant (sweet from the chocolate, herby from the lavender), bringing us back to each of our childhoods of being outdoors, carefree and light-hearted. The tartness from the strawberries and the salty crunch from the almond brittle just brought it all home for us. Great, great dessert by pastry chef, Ellen Mirsky at PUBLIC. 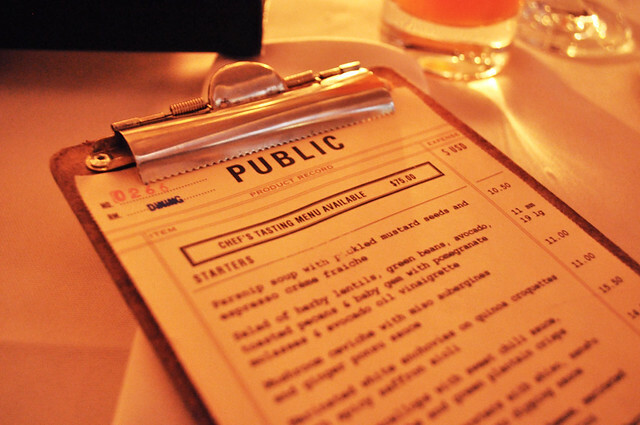 Findings: Ariana and I had the best time at PUBLIC, as its eclectic cuisine and design-savvy ambiance really resonated with our senses in so many aspects. The team behind PUBLIC put just as much hard work, dedication, and commitment in the kitchen as it does with the aesthetics of the restaurant's beautiful, multi-dimensional space. Many times, restaurants succeed only in one of the two areas and not both, so it was definitely refreshing to see that PUBLIC could deliver both quite well (another such restaurant that fits this exception is The NoMad). 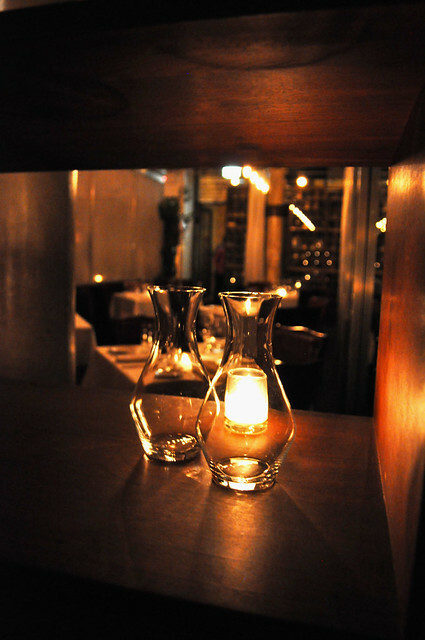 I was very impressed with the caliber of cuisine being delivered from the kitchen, so I would love to go back to try the other items on the a la carte menu and perhaps also for the tasting menu. Plus, its wine mailbox program sounds so awesome and fun! Price point: $12 for each cocktail, 11 for the starter, $24-28 for each main course, $9 for dessert.